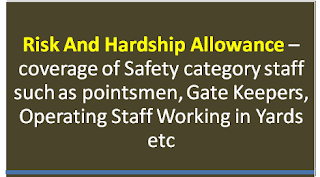 Sub: Risk And Hardship Allowance – coverage of Safety category staff such as pointsmen, Gate Keepers, Operating Staff Working in Yards etc., Electrical Staff in TRD, Staff of AC coaches, EMUs, Electrical Workshops & Staff working in General Services (Power and Train lighting) and staff of S&T Department in Railways – reg. In the NFIR’s PNM meeting held with the Railway Board on 10th /11th May ,2018 the PNM agenda Item No.14/2018, on the above subject was discussed. During discussion, the Federation suggested that views of the Zonal Railways may be called for in the matter and thereafter the issue can be discussed in detail. Federation however notes that there has been no communication from Railway Board about the progress made on the issue. NFIR, therefore, requests the Railway Board to arrange to furnish the comments if any, received from Zonal Railways to enable the Federation to consider and hold discussions with the Board.